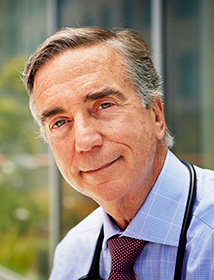 In Lowering Cancer Risk, (Excerpted from Dr. Andrew Weil’s website), Dr. Donald Abrams discusses how integrative medicine fits into cancer prevention. Let’s talk about prevention. What are the basic tenets of integrative medicine (IM) in cancer prevention? IM dietary recommendations for cancer prevention are much the same as they are for individuals being treated for cancer – consume a plant-based diet focusing on an array of fruits and vegetables of different colors. Cruciferous vegetables such as broccoli, cauliflower and cabbage contain a cancer preventing compound so potent that is being investigated as a chemotherapy agent. Eat berries for their beneficial phytonutrients and antioxidants. Emphasizing fruits and vegetables, whole grains, nuts, cold water fish that provide omega-3 fatty acids (fish eaters have a reduced risk of cancer) is the best nutritional strategy. At the same time, you should reduce your intake of animal fats in general and red meat and dairy products in particular – this could help control any cancer-promoting inflammation in the body. Stay away from refined sugar and heavily refined carbohydrates because of their effect on insulin production and insulin-like growth factors, which promote inflammation and are also associated with cancer cell division. And don’t forget physical activity. There’s a chapter in the book about how important exercise is for cancer risk reduction. We know that it helps protect against colon and breast cancer, and possibly endometrial, lung and prostate cancer. Physical activity is also essential for maintaining a healthy body weight since obesity is a major risk factor for many cancers. All told, more than 180 epidemiological studies confirm a cancer-protective effect for physical activity. In How to Help Prevent Breast Cancer, Dr. Mercola offers a great list of integrative prevention tips, (scroll to bottom of article). For more specific information, click on these links detox, diet, exercise, supplements, bio-identical hormones, transform stress & sleep.